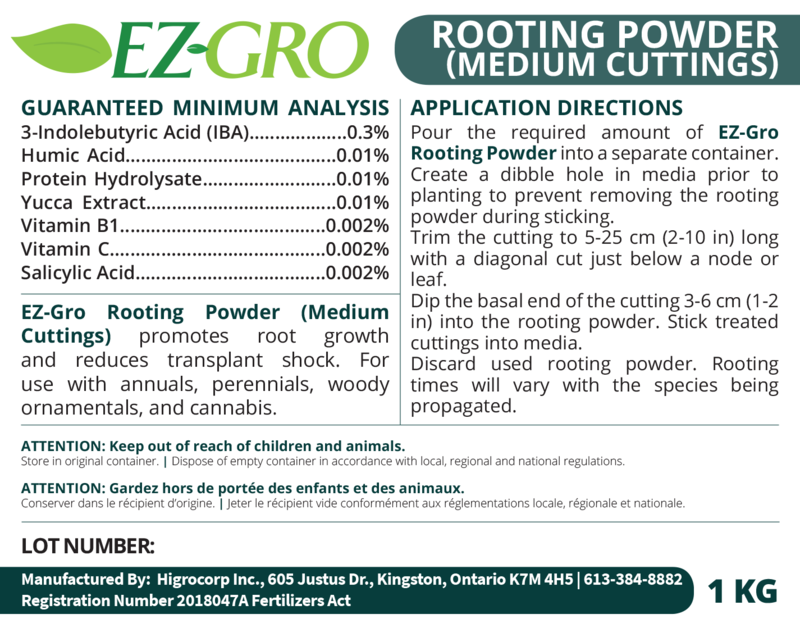 EZ-Gro Rooting Powder (Medium Cuttings) promotes root growth and reduces transplant shock. For use with annuals, perennials, woody ornamentals, and cannabis. EZ-Gro’s Rooting Powders promote root growth and help reduce transplant shock. Registered with the CFIA, and containing IBA and six biostimulants, these rooting powders provide a complex set of ingredients to help your cuttings thrive. • Salicylic Acid helps protect against drought and salinity. • Vitamin B1 improves health and vitality, while Vitamin C aids in control of cell growth. • Humic Acid stimulates germination, and enhances root, leaf and shoot growth. • Protein Hydrolysate provides amino acids and a touch of nitrogen to give your cuttings a boost.